Discussion in 'MacBook' started by dexykat, Aug 3, 2011.
please see attached picture for a more accurate understanding. Try going to the Partition tab, select the number of partitions you want then under Options select the type of partition map that you want then click Apply. Was it previously formatted for a different system? A different (Windows) computer? 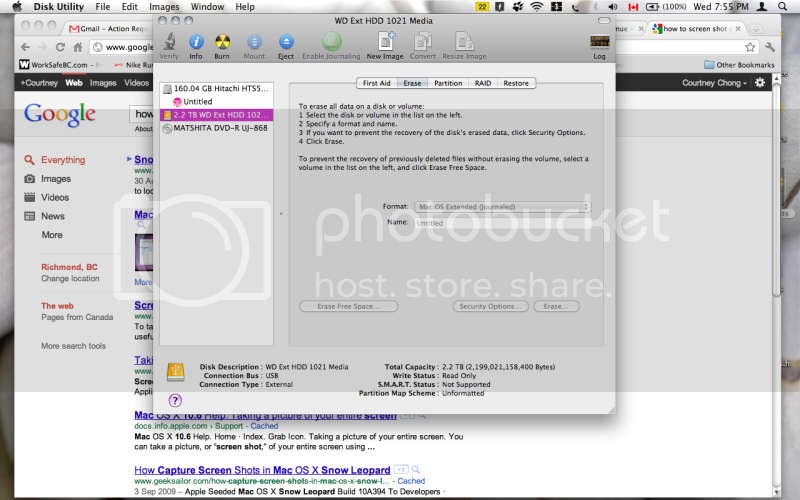 Does it show up in Finder? nope, its unmounted, and i can't click mount. it shows up "the disk you inserted was not readable by this computer"
Have you tried seeing if it is recognized by other computers? 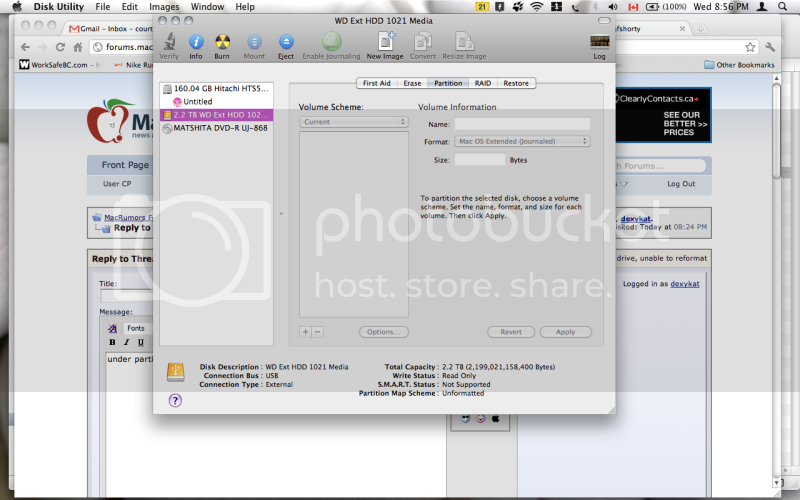 Do you have the Western Digital SmartWare installed? Can it see the drive? I'm thinking it might be a bad cable or power supply. Any way you can try it with a different cable or with a different computer (Mac or PC)? Sometimes when the power supplies go bad the drive will light up and make noise but won't spin up and mount as it's not receiving enough power. I don't know if your model has SmartWare (or something else) the newer models do, so it'd be worth checking and downloading if available. ya so i found the software, installed it and it doesn't even see it, the only thing that does see it is disk utility, which makes me think its getting power. Have you looked at the Western Digital Community forums to see if there's anything there that might be helpful. Still think it might be the power supply. In the past LaCie external hard drives had problems with power supplies going bad and the symptoms were pretty much the same as yours if I recall correctly. i guess i'll just see what i can do. I hope you can get it worked out. It could be the power supply, but your thinking is that the light is illuminating, indicating the faulty power supply? My understanding is that when these types of power supplies go bad they will provide some power, like enough for the light to light and sometimes the drive will make noises like it's working, but it doesn't provide enough power to spin the drive all the way up and mount. I trust your understanding of this. However, on the manufacturer's choice, they should have another way of indicating a poor/faulty power supply than just a nearly unnoticeable change. Perhaps a flashing indicator? But that's getting off topic a little bit. Do you have it under a warranty or insurance plan of any kind?